Spaces are at the very top of the ClickUp hierarchy, and are the first organizational level that you encounter within your Team. Almost everything in ClickUp is customizable, and most settings (including Statuses and ClickApps) are implemented at the Space level. By default, all Projects and Lists will inherit settings from their parent Spaces. When you're ready to switch Spaces, navigating between Spaces and editing them is also easy. And when you're finished with a Space, quickly archive it to get it out of the way. You can also unarchive Spaces at any time. Keep in mind that you are not locked into these settings when creating Spaces. You can change them at any time. Which type of Space should I choose? Once you click to create a Space, you'll be given two options. You can create a completely new Space, or you can create a Space based off of an existing template. This doc will detail the creation steps for both of these Space types. Everyone: By choosing "Everyone", your entire team will have access to this Space. Private: By selecting private, you limit who has access to this Space. You can customize this Space by selecting only those whom you want to have access. This is what makes Spaces great for working with individual clients. With Simple Statuses, your tasks in this Space will either be done or not done. These types of statuses are ideal for simple to-do lists. If you choose Custom Statuses, you will be able to create your own Custom Workflow. Simply create a status for each step of your workflow, and press enter. You can change the color of each Custom Status by selecting the colorful box beside the status titles. Multiple Assignees: By checking this box, you may have more than one assignee for each task within this Space. If this box is unchecked, you can only have one assignee for each task. Due Dates: Specify deadlines for specific tasks. Priorities: Clarify when each task must be completed by classifying each task as "Urgent", "High", "Normal", or "Low". Time Tracking: Keep a record of how long you work on tasks within this Space, and gain new insight into your workflow. Tags: Organize tasks on a whole new level, and give your tasks a renewed sense of purpose. Time Estimates: Gauge how long you believe it will take to complete each task within your Space. Custom Fields: Create unique task columns to manage a budget, client contact info and much more. Dependency Warning: Before closing a task that is waiting on another task, ClickUp can display a warning message to ensure tasks are closed in the proper order. 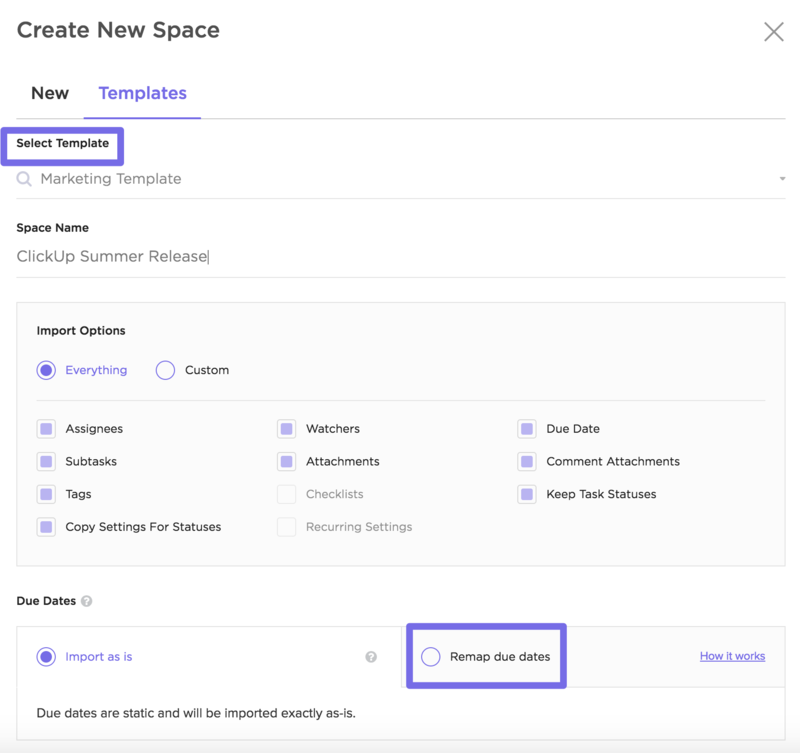 If you select the option to create a Space from a Template, you'll be able to customize exactly how to implement the template into your new Space. Click Select Template to choose which saved template you'd like to use. Enter a new Space name. Under Import Options , you can choose to keep retain all of your templated features by selecting Everything . You can also click Custom to select specific elements to carry over to the new Space. Under the Due Dates section, you can choose to import the template's due dates as they are, or remap them according to your preference!